I prepared the following appetizer for our Chef Spotlight dinner where we highlighted Spanish Chefs and cuisine. It's an easy to prepare dish which you can do on a grill or roast in your oven. Besides... doesn't everything taste better with bacon?! The Spanish love bacon, which we cure and air-dry in the same way as our famous jamon. 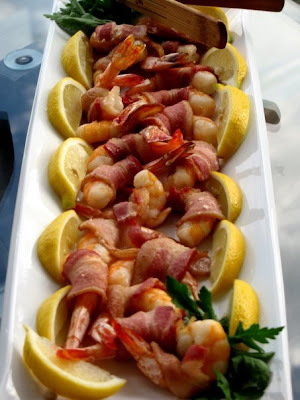 This combination of prawns and bacon is inspired and very popular, and can be found at most Tapas bar, as well as in many banquets and receptions. It is an ideal treat for your guests when having a party at home! Cut the bacon (or jamon, if using it) into pieces which will wrap generously round the prawns. Place the wrapped prawns down flat on a board and skewer them through the fattest part and the tail, making sure the bacon/jamon is firmly fixed. Season generously and drizzle with the oil. On a high heat, griddle, hrill or barbecue the prawn and bacon brochettes for 2-3 minutes on each side, so thebacon/jamon crisps up. Alternatively , roast in a hot oven (425ºF) on an oiled baking tray for 8-10 minutes. Squeeze over the juice of the lemon wedges and serve immediately.